After our Mt. 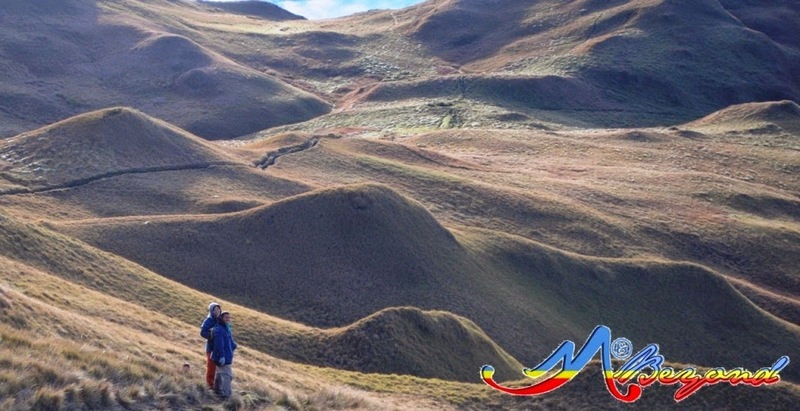 Humarap and Matabungka Falls adventure, the final trip is the Seven Falls of San Pablo. 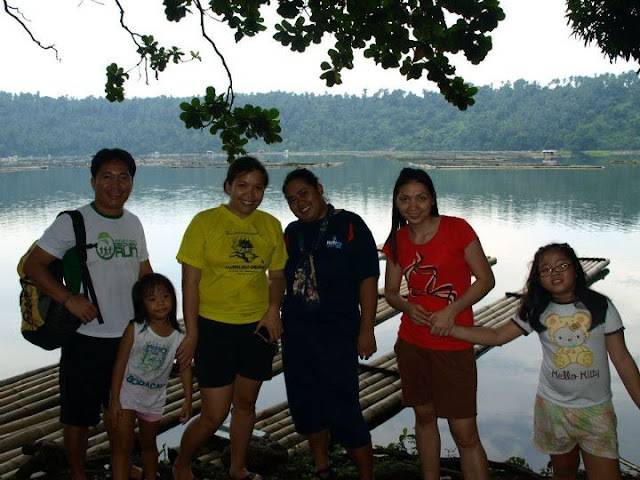 First stop was the Sampaloc Lake right at the center of San Pablo. We had the view of Mt. Kalisungan and the neighboring mountains as a backdrop. 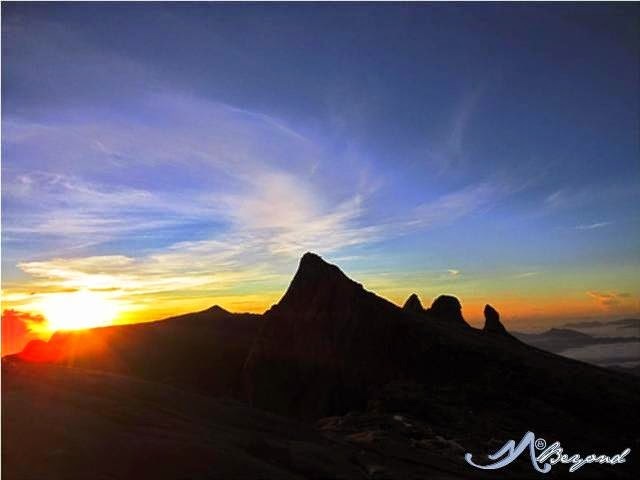 This lake is said to be the biggest among the 7 lakes with a circumference of 3.7 kilometers. But on the downside, it is rated as the riskiest and most vulnerable among the lakes. The presence of inhabitants surroundings the lake has greatly affected its condition. The rain fell just before we left for Bunot Lake and the downpour grew as we approached the area. We found no sign of a view deck or tourist information center. It was through the lake yard of a kind local that we managed for quick peek of this San Pablo wonder. On our way to Palakpakin Lake, the rain thankfully stopped. With 5 more lakes to visit, our energy was revived by the small glimpse of sunlight. The best viewpoint of Palakpakin Lake is the bridge connecting Barangay San Lorenzo and Barangay San Buenaventura. This time our backdrop is Mt. Banahaw and Mt. Cristobal. We saw kids diving all the way from the bridge into the lake which must mean that it is a pretty deep lake. Whew! Just a few kilometers from Palakpakin Lake into Brgy. 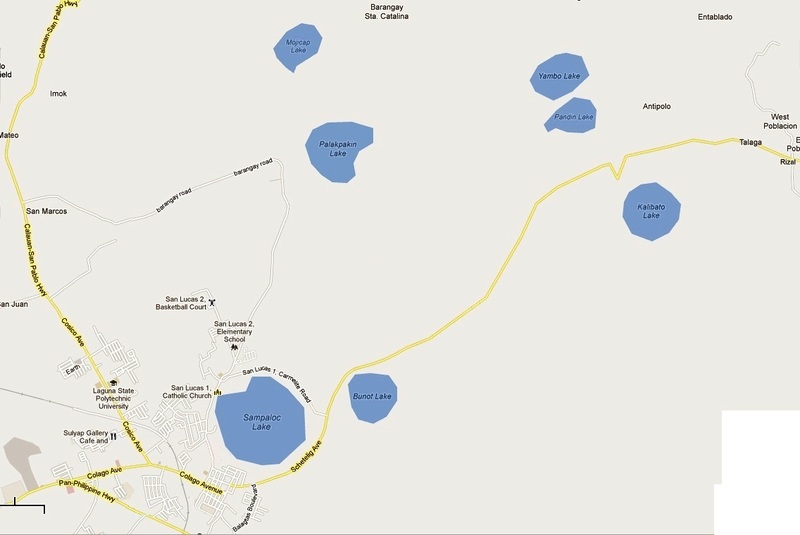 Catalina is the Mojicap lake. On our way to Lakes Pandin and Yambo, my daughter’s slippers snapped. Daddy had no other choice but to carry her during the 30-minute trek. With the downpour earlier, my kiddos got mud all over their legs. The sight of Pandin's water offered a great temptation for a swim... But we don't have extra clothes along, the knee-deep dip was all we did. Lake Pandin is said to be the best picnic place among the seven lakes where you can dine by the raft or simply dip in the water. 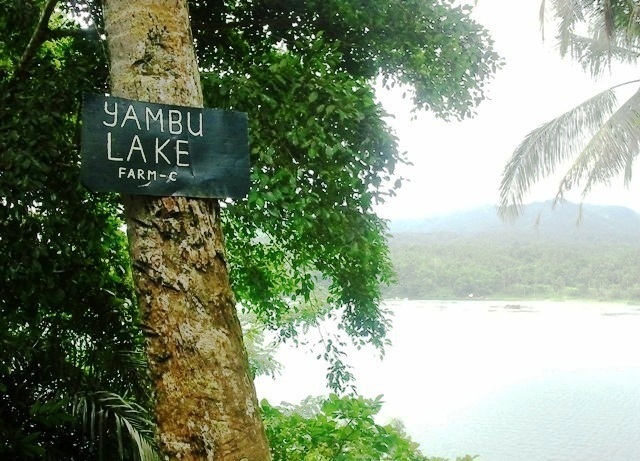 Lake Pandin and Yambo are also known as twin lakes that are separated by a strip of land. 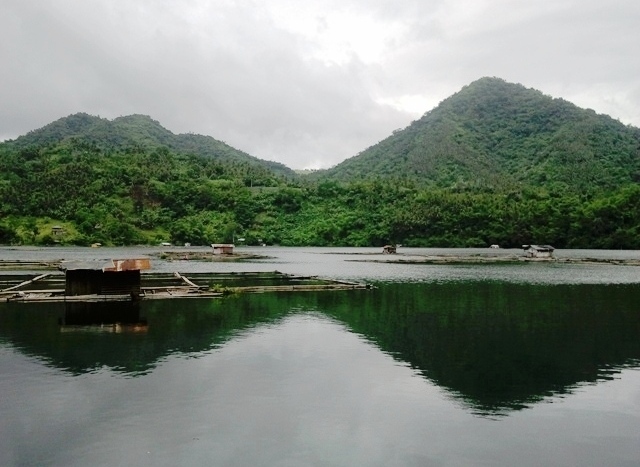 Rafting through Lake Pandin is said to be the easiest way to reach Lake Yambo but another alternative is to do a near 1-hour trek; just coordinate it with the locals that are managing the area. It was near 5pm when we reached the jump-off of Calibato Lake. The trail down to the lake is situated between huge boulders filled with plants/vegetation. This gave an eerie atmosphere effect coupled with the absence of sunlight. 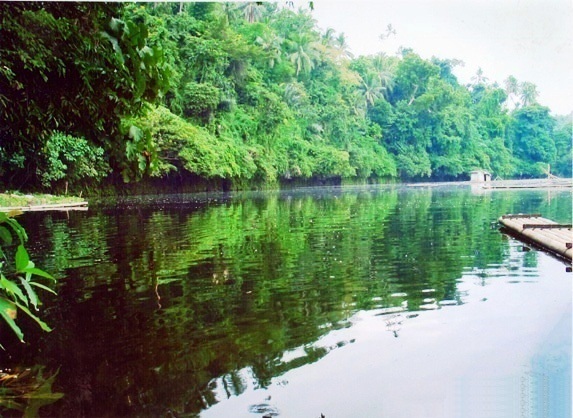 At Calibato lake, we were surprised by its tranquility. Even with fishermen around, we heard no voices... It was like a monk-silence feeling and we're anxious that any noise might awaken someone or something. Just before 6pm, we’re on the road again for our trip back home... Kudos to a well-enjoyed trip! Hi! I'm really interested in experiencing this adventure, and you're one of the very few blogs that have done a blog entry on a 1-day tour. Did you get any tour packages or did your group do everything on your own? Would appreciate the help! Thank you! Hi, thanks for reading.. if you want to avail a tour package, you may email travel.buddy@rocketmail.com.